A scientist, researcher, educator, and pioneer in the creation-evolution field makes the compelling case that neither creationists nor evolutionists have it right, and that the truth can only emerge if thinking, not beliefs, is put first. Nothing could be more fundamental than the questions of: Where did we come from? Why are we here? Where are we going? Nothing could be more true than the fact that virtually no one has answers they can rationally defend if all the evidence is considered. If we do not know our origin or destiny, then we cannot know how to properly live. The world’s precarious state, and the prevailing sense of futility and meaninglessness are symptoms of either having no answers, or having the wrong ones. Experts have reached no consensus on these questions in spite of thousands of years of trying. So the average person either latches onto some convenient and attractive belief propped up with desire, hope, and faith, or gives up and ignores the topics altogether. This book offers the promise of turning that all around. The key is to put honest thinking and evidence ahead of materialistic, religious, scientific, or philosophic ideologies. Pursuing truth in this way, and without fear of where it might lead, is arguably our highest responsibility. When we approach the big questions as if thinking matters, we are led to exactly where the world needs to go, a place of honesty, truth, confidence, solutions, and love. Dr. Wysong masterfully teaches us how to reach within, use our own minds, consider honestly all the evidence, and remain open-minded. The result is beautiful in its simplicity and wonderful in the hope, meaning, and purpose it brings. If you can dare to set your presuppositions about this topic aside, and trust the simple and honest beauty of facts, evidence, and your own reasoning faculties, this book will open your mind to exciting new vistas of truth and understanding. 15 Are We Selected Mutants? 34 Reason, Or Belief And Faith? 58 Why Is Life So Tough And Cruel? Where did we come from? Where are we going? Why are we here? These questions have forever intrigued humankind. They remain shrouded in mystery in spite of trillions of dollars and countless lives devoted to the search. Practically every human effort, other than supplying food, shelter, clothes, comfort, and entertainment, has been devoted to trying to comprehend who we are. Many aspects of space exploration, archeology, paleontology, the life sciences, history, philosophy, and religion have little utility other than as tools to attempt to understand our origin, destiny and place in the universe. In spite of all the effort, there is no agreement. Many simply dismiss the matter because they feel inadequate to the task, are too lazy to do the mental legwork, or fear where probing may lead. In spite of all the uncertainty, practically no one approaches these issues with an open mind. Instead, people search using the blinders of preformed beliefs they have become very fond, jealous, and protective of. Also standing in the way of answers are the many dizzying problems that arise when we try to contemplate time and space. We easily become exasperated by thoughts such as the first and the last thing must have had something prior to and after... but then they would not be first or last... but if there is no first or last then things must be forever going both ways... but that doesn’t make sense because our entire experience and logical day-to-day processes depend on firsts and lasts, causes and effects. It’s easy to throw our hands up and conclude that answers are unknowable. But we don’t like being intellectually forlorn and just soldiering on with blank spaces in our minds. So we form firm beliefs even if we cannot rationally defend them. For example, materialists believe answers reside in atoms and subatomic particles. But that is a faith that leaves unsettling questions about where those atoms and the forces governing them came from. Religionists put faith in holy books. But they must then ignore that such faith is based upon words of humans (spoken and written), not clear messages booming from heaven. In all of this probing, and allegiance to ideas that cannot fully be defended, we fail to come to grips with this fact: Reality, that is to say, the truth about our world and our place in it, is totally oblivious to our thoughts about it. This lack of connection between reality and our beliefs is because we model conclusions after our desires, not because open exploration, reason, and evidence fail us. We also set aside the fact that knowledge is never at an end point. Our world is mostly unknown, and much of it unknowable. Simply saying “I believe” cannot define the world in a complete and absolute sense. If knowledge is always incomplete, how can we ever arrive at truth? It can be done in degrees, but only by using the correct method. Evidence (reality) and reason must take precedence over preexisting beliefs. It means wiping the slate clean and starting from zero, not doing what we all are inclined to do: assume a certain truth and then attempt to reinforce it with evidence and reason. Getting as close to truth and reality as possible is arguably our most important responsibility. Learning is boundless if we could just free our minds from bias, apply clear thinking, have the willingness to rely on ourselves, and then accept what is discovered regardless of its implications. Truth is all we have to fear. But there is really no sense fearing it since we are a part of a universe that irresistibly and unerringly bends to truth anyway. The usual venues for exploring the big questions are materialistic science, philosophy, and religion. These can be tedious and difficult. People spend whole lifetimes in these disciplines and neither master them, nor arrive at answers of defensible certainty. Little wonder the big questions are put aside, guessed at, or consensus opinion adopted—and then given the sacrosanct status of belief. Usually the stronger the belief, the lower the intellectual price paid to obtain it. Science, philosophy, and religion each contain morsels of truth. But glimpsing reality requires integrating all spheres of knowledge and experience. Unfortunately, standing in the way is our usual tendency to partition, divide, and separate. We create an artificial world of subject textbooks, university departments, specialties, and subspecialties. But truth is multidisciplinary and all embracing. Science needs to integrate religion and philosophy. Philosophy and religion need to be tethered to the discoveries of real science. Although, as you will see, the big questions can be answered by an aborigine untouched by twenty-first century learning, the modern educated skeptic needs more technical answers. So at times this will not be a briskly told page turner. If it gets tough, plan on reading small amounts and digesting in between. Take your time and try to understand the material at each chapter step. Please bear with me as we work our way through technically demanding and emotionally challenging topics. I face the task of writing this to be understandable to the average high school educated person and at the same time competent for scientists, philosophers, and theologians. All the while I must struggle to ease those who think they are sure onto paths that may threaten their footholds. Attempting to do this so readers will give the entire message a fair hearing and not fling the book aside, has taken me many years. Even so, the reactions of virtually every reviewer have left me with frustrating feelings of inadequacy. Clearly, since this book is designed to challenge beliefs, and all people have beliefs, I simply cannot avoid stepping on toes. Be assured, however, I am trying to do it as gently as possible in the hope that you will stay with me to see the wonderful hope that open thinking can bring. If you feel some things are over your head (or under it), or feel personally offended, don’t get lost in detail or let an objection prevent you from moving on. You will surely have moments of “Yeah but...,” or “What about...,” and “That can’t be true because…” Virtually every objection and concern will be addressed if you continue reading. There is a logical flow. Each chapter builds on the previous ones and accumulates to the final answers to the big questions. The thoughts and conclusions in each chapter are only reasonable with the previous ones as a backdrop. Like a puzzle, all the pieces must be in place before the full picture emerges. So it would be unfair to me and to you for you to read the chapters out of sequence. To achieve understanding, the whole package must be opened layer by layer. Watch for light bulbs to switch on in your mind signaling that you are learning what you sensed all along. Hopefully you will enjoy many such eureka experiences (some readers report chills or hair standing up on the back of the neck) since, as you will see, truth discovered is truth that was within all along. If you are stuck at any point, object, or become upset, we have built this website specifically for you. Come here, ask your question, make a correction, vent your complaint... or tell me what I like most of all: how you agree with me. IN THIS SECTION: Arguably the most noble and ethical thing we can ever do is search for truth. Without truth, upon what will we base our actions? But such a pursuit is the most difficult of all tasks. Perhaps early in life we were given beliefs by others, told to guard them carefully, and not bother with further investigation. If we do probe on our own we may find truth to be so elusive that we quit the search in frustration and go with the flow of popular opinions. One thing is certain and very exciting: there is truth in an absolute sense and it is out there waiting for discovery. But finding it will not be as simple as keeping beliefs we were spoon fed as a child, nor as impossible as human attempts at it would suggest. Let’s start at the only place from which truth can be hoped to be viewed but where few people dare to begin: with the honesty of an open mind and the courage to go where that leads. Let’s get one thing settled right off the bat. All people know, but few of us squarely face the fact that there is a truth underlying our reality. There is only one true explanation for where we came from, why we exist, and what our purpose is. Although our fears, desires, and pet beliefs may obscure it, it is still there in an absolute sense. With that said, all that is left is the search. That’s the hard part. But not because truth is hiding, obscure, or over our heads. The search is only difficult because we—our preformed beliefs, fears, desires, egos, and physical limitations—get in the way. If someone has a better idea, even one that is much nearer to truth than the accepted norm, they need have no fear of having it stolen. Rather, as Howard Aiken lamented, they will be faced with the almost impossible task of trying to ram the idea down people’s throats. On the other hand, some consider it intellectually incorrect for anyone to claim truth. Others say they own the truth because it’s what they were taught as a child. Yet others don’t much care; having day-to-day needs met and deriving enjoyment from life is enough. The open pursuit of truth exposes our beliefs to challenge. New information might also mean change. But there is nothing as distasteful to the human psyche as being wrong and facing the burden of change—particularly when we have been so right. Openly considering evidence and going where it leads means we might have to discard an entire life of error and misdirection. That takes courage and an unusual heart. It means no longer pretending to know with certainty what nobody can be sure about. It is also lonely. Many prefer being wrong and part of a group, than being right all alone. So the best way to avoid these predicaments is to do no pioneering but rather probe for the lowest common denominator of human achievement. In the early 70’s I wrote a book on the creation-evolution controversy detailing the facts and arguments on both sides of the debate. That is now in its twelfth printing. It remains current not only because it is a fair treatment of both sides, but because the basic facts and philosophy on the subject have not changed or advanced. The following chapters will not be as thorough so I encourage you to refer to that prior work and others referenced in the resource section of this book for further details and documentation. In the succeeding chapters I will review the main arguments and update the issue with some new ones. Most importantly, I hope to leave you with principles that you can derive, own, and apply on your own. Origins is an emotionally charged subject. Evolutionists think that science itself is at stake. Creationists feel that the battle is no less than one of good versus evil. On the outside of the fray are those who view the subject as either unimportant or unsolvable. The debate has particularly picked up steam as religious parents press politicians and judges to allow equal time for creationism in public schools. The educational and scientific communities panic at the thought. They are convinced that any alternative ideas, such as Biblical creationism or intelligent design (not necessarily the same thing), are nothing more than a ruse to convert schools into dark-age catechism classes. There are basic logical and scientific principles that apply to the question of origins. These overriding principles are normally lost in the smoke of smaller arguments about missing links, arks on mountains, finches on islands, and fossils. Without a proper framework to fit facts into, it’s impossible to determine where they lead. What follows in this and the following two chapters will provide such a framework, and, although couched in scientific terms, is nothing more than everyday common sense. The preeminent question that we must address in trying to determine the cause of our physical reality is this: Does our physical world hold within itself the capability to cause its own origin, and then serve as a raw material for the transformation of life from simple to complex? If it does, then evolution is possible. If it does not, then we must look for another cause. The order in our world is defined by information. Information is what imparts meaning to books, blueprints, and computer programs. We normally think of information as it relates to language, but even natural objects like trees and people contain information; even rocks and atoms do. Information is something encoded in the hardwiring of matter. It dictates all properties of matter. An atom has information about how its electrons and nuclear components behave. Carbon has carbon information, hydrogen has hydrogen information, and so on. Atoms stay as they are because that is what the information in their blueprints dictates. We easily forget how confounding nature’s processes would have been prior to scientific enlightenment. For example, before the microscope and an understanding of genetics there were countless ideas about procreation. We may poke fun at them now, but in their time they were perfectly reasonable. In fact, when examined closely and compared to modern knowledge, there seems to be little difference. One explanation for how humans formed was that babies grew from a very small version of the same thing—termed a homunculus. This theory was termed preformation and competed with epigenesis (the spontaneous generation of life from organic material). These ideas emerged at a time when mechanistic explanations for the world began to blossom and struggled for reconciliation with religious doctrine. We live in an age of seemingly endless possibilities. The word impossible is like a fighting word. As discovery proceeds, the realm of the impossible continues to shrink. Looking back over our history and considering how incomplete our knowledge is at any given time, the word should be used with extreme caution. Nevertheless, from a practical standpoint, our whole lives revolve around and depend upon what we believe to be possible and what we think is not. I think it’s impossible to fix my computer with a hammer. So when it freezes up or loses data, I don’t start hitting it with a hammer. I think it’s very possible that a technician at a computer store can help and so I set the hammer down and call the store. Such practical reasoning occurs on a daily basis with all of us and makes life livable. In days long ago, black-robed alchemists could be found brooding over crucibles and alembics attempting to transmutate dust into gold. They also tried their hand at creating life and producing elixirs for immortality. Today we look back and chuckle. Although we think such antics have been discredited, the alchemists never really went away. Spontaneous generation is the old belief that life automatically arises from nonliving matter. It was a reasonable thing to assume in the pre-scientific era since there were no microscopes to identify what caused the mud to come alive with every sort of critter popping up out of it. Now, in every introductory biology textbook, the disproof of spontaneous generation is featured as part of the proud history of the march of science. Experiments by Redi, Spallanzani, and Pasteur demonstrated that if the starting organic material was rendered lifeless by cooking it, no life appeared. Life arose only if there was preexisting life. For life to arise spontaneously out of inorganic matter, the basic building blocks must be formed first. The blocks would include amino acids (precursors to proteins and enzymes), sugars (precursors to carbohydrates), glycerol and fatty acids (precursors to lipids), and nucleotides (precursors to DNA and RNA). This oversimplifies the nuts and bolts required, but it’s a start for us to look at in terms of feasibility. Chains of amino acids form proteins that help make up the structure of living matter. But they are most important because they comprise enzymes, the catalysts that drive the metabolic machinery of life. All the components of life could be present, but without enzymes nothing would happen other than Second Law degradation. In order to address two of the favorite proofs of evolution, time and chance, we must work with probabilities. Since anything is theoretically possible we must have a convenient way of expressing very large and very small probability numbers. Superscripts are a way to do that. Using them is kind of fun and it even gives a sense of power to be able to express something like 1,000,000,000,000,000,000,000,000,000 (or whatever that very long word would be) by just saying 1027. But this is a two edged sword. When using such representations our sense of size can be lost because a small number in the superscript can mean a really huge quantity. It is a popular assumption that the universe is about 15-20 billion years old, and the Earth about six billion. Our Homo ancestor supposedly appeared four million years ago, took three-and-a-half million years to invent fire and another 490,000 years to begin agriculture. Such dates have been repeated so often in even the most learned of circles that they have become like scientific fact. Also, since vast amounts of time are presumably needed to form the universe and life, it is reasoned that there must be vast amounts of time. On the other hand there are holy book believers who think the Earth is relatively young. Both of these beliefs put ideology ahead of facts. What does the evidence really say? In actual fact, there is the sudden appearance of life at the Cambrian layer. Thousands of plants and animals appear there and upward in the strata. There are no antecedents in Precambrian formations. For example, there is no record of the evolution of flowering plants or ferns. 15. ARE WE SELECTED MUTANTS? If we were to start with a one-celled organism, forgetting for the moment all the mechanistic impossibilities leading to that, is there evidence of evolution in the big picture sense? In other words, has there been biological shape shifting, the transmutation of one kind of creature into another? Evolutionists claim that transmutation (though they wouldn’t use that word) has occurred through a combination of mutations and selection. This is called neo-Darwinism. Mutations are thought to create the genetic fodder for a potential selective advantage. The environment will then come into play to dictate whether populations with the new characteristic have a survival advantage over those without it. Evolution rests most of its case on the argument that if things are similar they are related. Brothers and sisters, for example, have similarities because they come from the same family tree. Applying this logic to all creatures is the basis for the evolutionary family tree. However, before similarity can assume the status of a law proving relationship, it must always apply. That’s what laws are and that’s what science is. But the ‘law of similarity’ is neither law nor science—if all the facts are let in. If evolution is taken to mean that creatures can vary and that similarities can prove relationship, then evolution is true and the case is closed. But that is not what evolution is. It is the ascent of atoms into every manner of creature employing nothing but materialistic means. It is a mistake to use extrapolation to prove that there is no limit to how much creatures can vary because they can be observed to vary a little. It is also false to assume that two things showing similar features proves they are ancestrally related. The alternative explanation of origins, intelligent design, does not prevent creatures from varying in response to the environment, nor does it deny that similarity can mean relationship. More often than not, we adopt beliefs because they are popular, are what our parents thought, or what we were taught in school. We are also led by our desires—accepting, justifying, and validating that which fits the lifestyle we wish to live and the security we long for. What we settle upon has little to do with truth, proof, or hard science. Beliefs are usually just popular and unambitious sorts of things. They percolate through the masses taking on a grandeur that does not fit their intellectually homely beginnings. Evolution, in the broad atom-to-man sense, is an egregious example of a widely accepted belief that has been adopted for all the wrong reasons: it’s what our teachers believe, what many religious leaders believe, is intellectually vogue, it keeps good scientific company, and justifies amoral freedom and unaccountability. Facts, logic, and evidence barely have a chance against those powerful reasons to accept and retain this belief. IN THIS SECTION: From time immemorial people have concluded that complex functional things are the product of mind. Evolution sidetracked that idea. Contrary to popular belief, that did not occur because of the force of scientific advance, but rather because of a beguiling secular ideology that broke the shackles of another ideology, religion. What has been lacking in this battle is the application of logic and a fair consideration of the evidence. If we put facts and reason ahead of ideology, let’s see where we are led. On the face of it, the detailed intricacy, roiling complexity, and staggering functionality of the world around us seem to suggest that it is the product of intelligence. That is the common sense conclusion humans have made since the beginning of time. I know, all those primitive people didn’t have our fancy sciences of embryology, comparative anatomy, biochemistry, and paleontology. But should we so easily discount basic human intuitive common sense? After all, we know of no exception to the rule that functionally complex things, with purpose beyond the capabilities of the components, demand intelligent causation. It appears plain that the natural world is made up of purposive compositions (matter and life) that have features not satisfactorily explained by non-manipulated natural forces. The simple fact of the matter is that left to its own resources, nature cannot create. In any other circumstance, when faced with extraordinary functional complexity, one would quickly, and without a second thought, assume the purposive intervention of design. But since that idea conflicts with the prevailing evolutionary ideology, it is either dismissed with some sort of off-hand remark about religious nuts, or not even considered. Ideology should not come first. Facts, science, and reason should. How does one objectively decide if something is designed or just a consequence of matter going about its business? First, definitions must be set. Words that commonly come into play on behalf of design include: complexity, purpose, function, and specificity. But none of these are very helpful. Instead of creating defined lines for debate, they tend to invite verbiage squabbles. Over and over throughout the universe, natural relationships and laws come together to create millions of circumstances perfect for the existence and continuance of life on Earth. It is that way through and through and presents a situation difficult to comprehend, absent intelligent causation. On the other hand, if mind is responsible for the existence of our reality, then it would be hard to imagine that there could be more evidence. The materialist believes that it is all spontaneous, the inevitable consequence of countless random events orchestrated by natural laws. He would also have to argue that the origin of natural laws is a spontaneous phenomenon. But if our reality is the lining up of an infinite number of improbable random events, all aligned perfectly to create the infinite complexity of the universe and life, that would argue strongly for an intelligent cause, not its absence. Underneath all reality is broiling and industrious machinery. An atom is not a static structure; it is a nano-machine. Everything within it—electrons, protons, neutrons, quanta—are moving and interdependent. Holding atomic machines together while the parts move about at thousands of miles per hour are strong and weak forces in the nucleus, and electromagnetic forces between electrons in their shells and the nucleus. An atom has plenty to occupy it just going about its business being what it is. It is not thinking about becoming something else unless it is tinkered with. If the nucleus is bombarded with radiation it may start to decay (the entire nuclear industry is based upon such nuclear changes). If electrons are added or taken away, the atom’s resulting imbalance will cause it to seek out ways to restore balance by combining with other atoms that may have too many or too few electrons (the entire chemical industry is based upon this). But such things are just normal social behavior of atom machines and are what they must do to keep running and be happy. We cannot get overly enthusiastic and construe from this behavior that an atom wants to become part of a novel, painting, computer, or amoeba. It is difficult enough to imagine complex organic molecules forming by chance, but it is impossible to fathom the complexity of a single cell, much less the hundreds of different kinds of them coming together to synchronize in tissues, organs, systems, organisms and whole humans. A single human cell is itself like a body, with little organelles, pumps, skin, circulation, digestion, and brain. The information controlling what a cell is and does is contained in the coils of DNA within the twisted chromosomes in the nucleus. If the library of DNA were extracted from all the cells in the body and bunched together, it would barely be invisible to the naked eye. However, if uncoiled and placed end to end it could reach to the sun and back 400 times. A ‘simple’ cell is no small sneeze. Some of the components of a cell thus far discovered are listed here. IN THIS SECTION: Beliefs underlie human actions. Whether we believe we are the product of evolutionary happenstance or the purposeful act of intelligence profoundly affects how we behave and approach life. Although religion is often cited for its ignominious history, the undercurrent of evolutionary theory for the past 100 years has likewise impeded human advance and caused incalculable human suffering. Society treats the subject of origins as if it were solved long ago. After all, like good consumers, we have paid the experts to settle the matter. If they magisterially proclaim that evolution is science, then that pretty much takes care of that. Nevertheless, only about ten percent of the population believes evolution in the atheistic sense. The rest, not wanting to appear to be repudiating science, believe evolution in some hybrid form wherein God either directs it like a maestro or started it all up and went on vacation. In academic and editorial circles, evolution is the default setting. Otherwise careful and skeptical writers and scientists pay homage to the creed with nary a doubt or critical thought. If an idea, regardless of its merit, is repeated as fact often enough and has the consensus of authority, it will become the truth of the age. Once the momentum of consensus is in place, few dare challenge it. Evolution has gained such momentum to the extent that if you question it your intellect is suspect. You are also automatically catalogued as one of those ‘strange’ people who hand out brochures, and seek to engage people in earnest discussions about the meaning of life, the signs of the times, our evil nature, and the need for salvation. People may be convinced of evolution because of the weight of authority (after all, the “experts know best”), the power of the word, evolution (after all, “things do change”), and by the historical defeats of religion by science (after all, "creation is blind holy book faith and evolution is science"). None of that is reason to make a belief, but it is powerful fodder for propaganda. Aside from all the science that militates against evolution, there are also some very pragmatic and ethical reasons to reject it. As is evident from the preceding, evolution is primarily a belief based upon another belief, materialism. Both beliefs attempt to justify one another. It is one thing wrapping its arms around itself, like two mirrors facing each other in an infinite regress of narcissism. With its feet planted firmly in midair, evolution has no traction in the world of real science and industry. In fact, the stardust-to-man hypothesis has arguably not brought to humankind one single useful fact, idea, product, technology, creature, or solution. IN THIS SECTION: Religious freedom is demanded, and yet the world is threatened by the opposing religious factions that result. No consensus is reached because few people come to the subject using reason and evaluating the evidence. Instead, like materialism and evolution, religion is a stronghold of belief and faith. It shouldn’t be. It, like science, should be about finding truth. The universe is scientifically true, rational, and without contradiction. The cause of that universe should have those same qualities, as should any religion that puts itself forth as representing that cause. After reading the preceding chapters, those of a religious persuasion may feel bolstered and heartened. But the primary takeaway from the foregoing should be that the SOLVER principles work. We have been led to the idea that mind underlies and is likely responsible for our reality. But so far, that’s all we can conclude. We don’t now get to leave our thinking tools behind and scatter pell-mell into every conceivable religious idea about who or what that mind is and what it has done or is doing. Establishing that there is mind underlying the universe says nothing about any particular religion. Most religions are built upon the concept of supernatural. The idea effectively does two things. First, it leads people to believe there is a mysterious domain not subject to reason and evidence. Secondly, it opens the flood gate for religious leaders claiming to have special access to the domain. The supernatural is the holy ground where religious leaders can claim special knowledge and from which they derive their authority. In other words, supernatural is the fundamental reason there is every manner of religious idea, and why people have separated themselves into religious leaders and followers. Human history is in large part religious history. But why? It is one thing to look up into the vast night sky and feel awe and reverence, or even go through a more sophisticated analysis such as we have in the previous sections. It is quite another to build cathedrals, have rituals, and live by codes believed to have been authored by the creator. How we got from the notion of creation to the thousands of religions and ideas about what the creator wants of us is essential in understanding religion. Although every college has comparative religion and religious history classes, and there have been countless books on the subject, let’s not rehash that subject matter. Instead, let’s just think for ourselves and do a Gedanken about how religion likely began and why it has transformed as it has. Religion is ordinarily thought of as spiritual, the opposite of material. However, religion has been mugged by materialism like about every other aspect of human thought. Materialism means to explain ourselves and the world by means of the material and to devote oneself to it. As we just learned with our Gedanken, all along religion’s developmental journey there were material people and material tools aiding and abetting its progress. Society has always been hesitant to hold religion accountable. This is presently evident by society’s incredible reticence and tolerance in the face of the religiously motivated terrorist movement. Religious institutions have been held up as sacred and untouchable domains. They are commonly thought to be our only hope for strong communities, family integrity, and the primary remedy to our supposed base and evil human instincts. It is just too unthinkable that the cure may also be a cause. People are inclined to trust. So they would be expected to assume that their emotional, ethical, psychological, and spiritual needs would be met by institutions that are widely advertised and generally accepted as the source of such fulfillment. Without another clear option, and fearing to wing it on their own, it is little wonder that people join religions and then protect them by excusing and justifying their failings. Every individual religious organization must define themselves. Once that is done they become static, since a definition, by definition, is inflexible. Since truth is a constantly unfolding phenomenon, that makes them anti-truth. That, in turn, makes such religious organizations anti-creator, since the creator is truth. Religions must also be intolerant. Defining God—which is the purpose of each religion—demands hostility toward all other definitions. Sectarianism is demanded because definitions include some things and must exclude others, and certainty about the next life is not compatible with tolerance in this one. Besides, the one true God of each religion would not be worthy of his omnipotent, omniscient, and omnipresent self, if He respected and endorsed the ‘one true,’ but false gods and doctrines of other religions. Although the fashionable position is to permit religion without restraint, this denies the power of belief. One need only look to history. The legacy of religion is not so much about man’s requited love of God, but of our insistence on arriving at certainties (in His name) that end up visiting immense misery on our fellow humans. Religion has prompted people to kill and torture one another based upon opinions about what God says about such things as whether the Earth moves, style of clothing, and the direction to be faced when praying. Once the assumption is made that a belief is The Truth, and that accepting or rejecting that belief is a life or death matter, then all rational bets are off. People can then feud over matters as trivial as the names of the seven dwarves and Santa’s reindeer. There is a perpetual war. The treasure being fought over is our minds. On the one side is the marketplace of fixed beliefs, on the other, open inquiry. So far the belief side has been the hands-down winner. People roll out the mind’s red carpet and let the brain usurpers have free access to every nook and cranny. Reasonable thought is pushed aside and the malignancy of fixed belief is allowed to dominate life. There are various books that are said to be written (inspired) by the creator of the universe. Some people are culturally born holy book believers, others think that such books are only loosely inspired, while yet others conclude that they are no different than any other book of human hands. Clearly a casual attitude is not appropriate. This is a matter that deserves our immediate and utmost attention. Think for a moment about how extraordinary the idea is that the creator of the universe authored a book. If it is true, then learning what the book says should be our consuming preoccupation. Such a book would be the most likely source of answers to the big questions. How could we be passive about the literal words of that which is responsible for our very existence? Let’s do a more detailed analysis of the Bible using some make-believe. This will help us step away from cultural assumptions and more objectively address the question of whether the creator wrote a holy book. Let’s say scientists were fiddling around in the laboratory genetically engineering viruses. One of the viruses had the interesting effect on humans of erasing all memory of anything having to do with holy books. Unfortunately, one day a beaker broke near an exhaust fan and a few droplets containing trillions of the viruses were released into the atmosphere. Carried on the wind, it was not long before the virus aerosol had infected every human on earth. The infected people would still know that there was unerring truth and rationality in the universe. They would also know they had an inner sense of ethic, that society needed morality to function, and that they were not responsible for their own existence. Such conclusions simply resulted from thinking. In other words, no divine revelation would be necessary to assess nature, conclude that they were the product of intelligence, and that a person’s conscience gave guidance. • Ordinary people can’t expect to understand the book on their own and need help from others with the gift of insight and interpretation. A kind reader of one of my books recently sent me a large packet of information, including copious scriptural references, in hopes of persuading me to her beliefs. 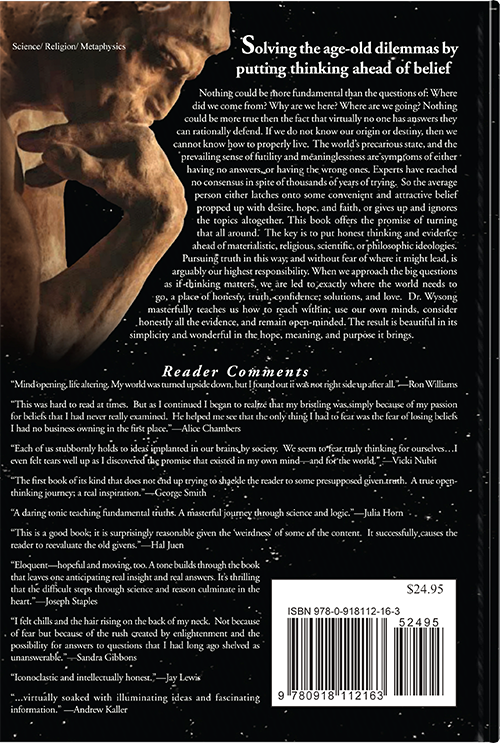 On one of the publications was placed a sticker with an image of a Bible and this inscription, “To detect what is false—study what is true.” In other words, since the Bible is true, all that contradicts it must be false. It is generally ignored that Jesus, the Hebrews before him, Mohammed, and other founders of religions did not write holy books during their lives. Holy books were not originally written in Middle-Age English, leather bound with gold embossed page edges, thumb notched, and then carefully guarded and passed down to this day. There was no consensus among Jews, even into the Christian era, as to which books were to be included in the Hebrew Bible (Old Testament). Catholic, Protestant, and Eastern Orthodox religions are in disagreement about the Hebrew Bible as well. The Christian Bible (New Testament) is also not set in stone. So there is no uninterrupted Bible tradition beginning with a first printing for Adam and Eve, and then extending to Jesus, and from Jesus down to this day. We naturally fear death because the survival instinct is built into us. This is true for all creatures, but humans one-up the biological world. We know how to build more fear into death by creating doctrines about imminent doom and eternal punishment. As motivation to get saved pronto, some religions say the creator is going to intercede in human affairs and bring the world to a catastrophic end—and it could happen at any moment. Those who have the right belief will survive in good style, those who don’t, well, unspeakable punishment is their destiny. As a religious tool to grow congregations, band people together and keep them quaking in fear, doomsday predictions have yielded bountiful dividends. It may seem at this point as if all we have done is tear down. First materialism and evolution were dismantled, then institutional religion and holy books. Since these systems of belief are the options commonly presented as solutions to the Big Questions, their disassembly may seem to leave us with nothing. However, shining veins of bright new ideas are being exposed as we chip away cemented givens. Exploring and harvesting these glimmers of hope will now be our focus. But first it was necessary that unworthy icons be dethroned. From a fair consideration of the evidence and the use of logic it seems persuasive that underneath matter is intelligence. IN THIS SECTION: The normal approach in attempting to answer the big questions is to just philosophize and think about it. Although reason is essential, thoughts by themselves have no anchors in certainty. To explore the unknown we must begin with the known. Since we live in physical bodies in a physical world, physical reality must be in tune with the correct answers to the big questions. People in general, and even science, other than at its cutting edge, seem unaware of the facts of the preceding chapter. Everyone remains in the stultifying grip of the materialistic thinking that all things in our world boil down to just small pieces of matter governed by known laws. This materialistic bias is reasonable only if we think at the surface of things. Apart from being wrong (other than at our four-dimensional level), materialism impedes human enlightenment and progress. The belief frames the world as a mere structure that can be disassembled and categorized into things like nuts versus bolts, and springs versus gears. This then leads to me versus you, us versus them, animal versus plant, inanimate versus animate, and visible versus invisible. Our physical reality dissolves to a nonphysical nothingness in which all the rules that we commonly associate with reality no longer apply. Somehow, out of this counterintuitive realm of timelessness, infinity, unpredictability, and countless dimensions our sane, predictable, four dimensional physical world appears. Those are the facts we must grapple with to answer the big questions. So what could be the ‘nothing’ that is sufficient to explain the infinite something of our universe? What could explain not only physicality, but us intelligent humans who are asking these questions? Physical things in themselves do not create intelligence, nor can they logically account for their own existence. Materialism, as will continue to be explained in this book, does not and cannot yield the answers no matter what nook and cranny of it is probed and prodded. The human mind has helped us reduce the heavens to understandable and predictable physical laws and to eliminate capricious and scary gods. The wonders that intelligence has created are staggering. But our feats and exploration are not without limits. Although it would seem that should put a damper on finding answers, acknowledging those limits is actually a key to understanding our origins and our place in the scheme of things. Let’s think about our thinkers. The brain is big and impressive, but also finite. Mark Twain once said that he thought he had a prodigious quantity of mind because it sometimes took him as much as a week to make it up. Although prodigious, its 10 billion neurons and up to 100,000 synapses (connections) per neuron are small numbers compared to infinity. So, by definition, solving problems with the material brain is limited since we face an infinite universe. Reason, therefore, tells us that there is a limit to reason. Humans once filled the heavens with gods to explain the world. These gods where thrown out when atomism and Newtonian science joined hands to form the belief of materialism. Mind became the product of matter, not matter the product of mind. In spite of the perorations of its advocates, matter has not lived up to its promise of providing answers to the big questions. Matter and the laws that govern it cannot explain themselves. Now, with new discoveries beyond matter, the curtain is being pulled back to reveal heavens that are once again filling with the things of the gods: information, intention, intelligence, and mind. IN THIS SECTION: If reality is other than matter, if it reduces to the nothingness of mind, if all is one, if time can be accessed in all directions, and if there are dimensions beyond our own, then there must be supporting evidence. There is. By bravely and openly exploring these new frontiers we get closer to answers to the big questions. The previous chapters provide logical and scientific evidence that underlying matter is space, information, the qualities of mind, interconnection, and non-linear time. We can surmise this understanding by using our reasoning faculties as well as consulting the esoteric work of quantum physicists and mathematicians. Our examination was cursory but should be sufficient to get us started on a new way of thinking about the big questions. Is there any evidence in our everyday lives, something we can personally experience or observe to suggest that there is any real empirical truth to this confusing reality? Yes there is. I hope you were successful with your dowsing experiment. If you were, nobody is going to convince you that what you experienced did not happen, correct? It doesn’t matter that there is no explanation, that conventional science has no clue as to what the forces are that cause the wires to move, or that your friends won’t believe you if you tell them. Keep this conviction you have with regard to your own experience in mind as we survey many other weird things that people experience. They are as convinced of their experiences as you are convinced of yours. Just because standard science and materialism does not have sufficient scope to explain such phenomena is no reason to reject them out of hand. Besides, as discussed in previous chapters, the underlying nature of reality fully allows for such events. Humans are made of matter. But underneath all of our protoplasm and atoms is the quantum nothingness of fields. Our bodies are also rational since they are defined by the rational sciences of anatomy, physiology, and biochemistry. Therefore, the fields of ‘nothing’ that underlie us must likewise be rational. Something that is physically nothing (fields), and yet rational, is exactly what intelligence, thought, and mind are. Therefore, as incredible as it may sound, the most scientific thing we can say about who we are at the fundamental level is that we are thought. A thought is not constrained by any of the physical constraints of the material world. A thought is timeless, eternal, and without limit in its creative potential. If we are fundamentally the nothing (in a physical sense) of thought, then one could expect that there might be evidence of our ability to break out of the physical shell restricting us to these four dimensions. There is. Plants and animals provide an objective field of study to test the holistic-quantum view of reality. They also provide evidence in support of the existence of mind underlying all of reality. New senses are being discovered that are poorly understood and for which no sense organs have even been identified. These senses demonstrate that our human view of reality does not define all of reality. Examples include the electrical fields generated by eels to sense their environment, the ability of sharks and rays to sense the electrical fields generated by prey, the thermographic heat sensing ability of some snakes, the web vibratory telegraphic abilities of spiders, and the magnetic compass in migratory birds and fish. If you think back through your life you will probably recollect experiences that are in keeping with some of the examples cited in the previous chapters. I can lay claim to none of the extraordinary abilities. But I have experienced déjà vu, contagious yawns, anticipating phone calls, guessing the time, dowsing (as described in the previous chapter), and witnessing some unusual animal capabilities. I recently listened to a program on the radio about the development of rocketry. Wernher Von Braun was being discussed, and just before the speaker was going to state the year of his death, I tried to guess it. I thought 1977. The commentator then said “1977.” I knew nothing about the man or his life. I impressed me very much. Holding us back from a fair evaluation of weird/paranormal phenomena are the chains of materialism. Western society, in particular, has tamed the world by dissecting and labeling its matter and that has created a deeply embedded bias. The process began over 2000 years ago with the Greeks’ atomism. Then Newton, Dalton, Lavoisier, and other fathers of the modern physical sciences permitted us to predict the behavior of matter and precisely measure it so that it could fit into tidy packages in stores and in our minds. Linneaus, in the eighteenth century, divvied up the biological world into classifications of kingdom, phylum, class, order, family, genus and species. Darwin and others reduced life itself to the mere outworking of inevitable physical events. Hutton, the father of geology, described the history of the Earth as a predictable, uniformitarian progression of geological processes. For all practical purposes, materialism has become a world religion blinding people to the possibilities that lie beyond it. It has done so on the sly because it has no specific agenda or defined intent that is readily apparent. As we have seen, even evolutionary based science and conventional religions have become cults of this faith-based, master religion. Matter is what we eat, drive to work in, and build our homes out of. We equate matter with the real, so that is where we place our trust and faith. Our day-to-day absorption in this physical reality is therefore what does all the proselytizing. Looking back over human history, the resistance to change would really be quite humorous if it were not such a serious matter. As a society we come to a consensus, marvel at how clever and enlightened we are when we discard old beliefs, then tend to swagger through the rest of life as if nothing else needs to be known or discovered. Only in the face of great resistance and at great peril do new ideas ever take hold. Then a new consensus is agreed upon—and on and on the sad story goes. The fact that we do eventually change once in awhile is great. The difficulty in doing so, the time it takes, and the persecution of those who are brave enough to drag us out of our intellectual doldrums and cockiness is nothing short of tragic. In the early 1900s when Wilbur and Orville Wright flew their plane, Scientific American dismissed the event as a hoax. Simon Newcomb, a professor of mathematics and astronomy at Johns Hopkins University showed scientifically that powered human flight was “utterly impossible.” For five years people looked up at the plane flying overhead but there was general denial that it ever left the ground. IN THIS SECTION: From earliest memory we are who we are. We will call this person we know so intimately the self-aware I. What is the source of the I? Why does it fundamentally not change? Can the coming together of unintelligent matter account for it? Where does it go upon death? Let’s look for the thing doing the looking and discover what we really are. It is much more than we can imagine. The materialist argues that the universe is comprised of matter obeying physical forces, and that’s it. There are laws of motion, gravity, electromagnetism, and strong and weak nuclear forces. These supposedly dictate wholly how things behave. After the Big Bang, when stardust atom ‘A’ combined with stardust atom ‘B,’ they did so not out of choice, but because they moved to the bidding of physical laws. Religion, as far as we know, is a uniquely human thing. Conscience, self-awareness, and the inclination to store information outside of ourselves seem to set us apart in nature. Our special qualities (if not in kind, at least to degree) also cause us to probe questions about our origins and purpose. In so many respects we seem to be something other—an other that is trapped in biological form. There is my body, and then there is the lawnmower. Self-awareness is created by the cleavage between subject and object, between knower and the thing known. We sense an essence within, an individuation as a self in a body. On the other hand, this self desires connection with others as well as with whatever is behind the great mystery of our origin. Free will, and the qualities of mind beyond rote mechanical chores, strongly argue that mind cannot be reduced to matter. So where is the I? That seems like the natural and logical question to ask. But it assumes that mind can be located, like under a microscope or by coordinates on a brain map. If we find that mind cannot be reduced to matter, then it makes no sense to assume it can be found in the four dimensions where matter resides. So there will be no expected materialistic answer to the question of where the mind is. The unexpected answer comes from returning to the leg work we have done in the previous chapters on the nature of underlying reality. Recall that matter is fundamentally nonmaterial and holographic. The brain, being matter, must also be fundamentally nonmaterial and holographic. This understanding would help explain how people with hydrocephalus, having essentially no brain, can be normal and store 280,000,000,000,000,000,000 (2.8 X 1020) bits of information over a lifetime. If the brain is holographic, even a small piece could contain functions of the whole brain, since, by comparison, one inch of holographic film can store the information of fifty, 1300-page Bibles. Death is certainly a curiosity and something not all of us face with the most grace and bravery. We instinctually fear death because survival is programmed into us. It is also feared because it is an unknown, an unknown to which some religions have attached the horror of eternal hell. Death is also associated with the pain that may precede it. But we do not know that death itself is unpleasant at all. Maybe it’s wonderful. If reality underneath is non-physical (which it is), and that realm is the real home for the I that survives bodily death, what could life be like there? How do we get there, how do we go about deciding to leave it for a physical life, and why would we do so? Why can’t we all recollect what life was like in a pre-physical existence if that is where we came from? Although the conclusions arrived at in this book are not perfect and without loose ends, they are at least more rational and evidence based than presupposed materialistic, philosophical, or religious belief and faith systems. Besides, a realistic goal is not to etch absolute answers in stone, but to edge closer to truth by opening the mind to discovery, facts, reason, and conscience. Surely there are many questions that flood into your mind as you consider the foregoing chapters. For example: If there is another plane that we go to and fro from, why aren’t we fully aware of these adventures? If we lived previous lives to learn lessons, why aren’t we consciously aware of the experiences to benefit from them? If we had a more full understanding of metaphysics in a pre-Earth existence, why don’t we carry this understanding to Earth? Why is Earth life so tough and cruel? Why are most religions in opposition to metaphysics? These are some I anticipate you have because I have had them as well. IN THIS SECTION: Clearly the materialistic pursuits of life beyond sustenance are meaningless and empty. But not having a clear conception of why we exist leaves few other choices. Fortunately, hints based upon reason and evidence are available to tell us where we come from and where we are going. The most likely answers to those questions—as revealed in the previous chapters—lead us to our purpose in life. It is a noble and exciting one that brings immeasurable fulfillment and hope. You have traveled a long path with me. 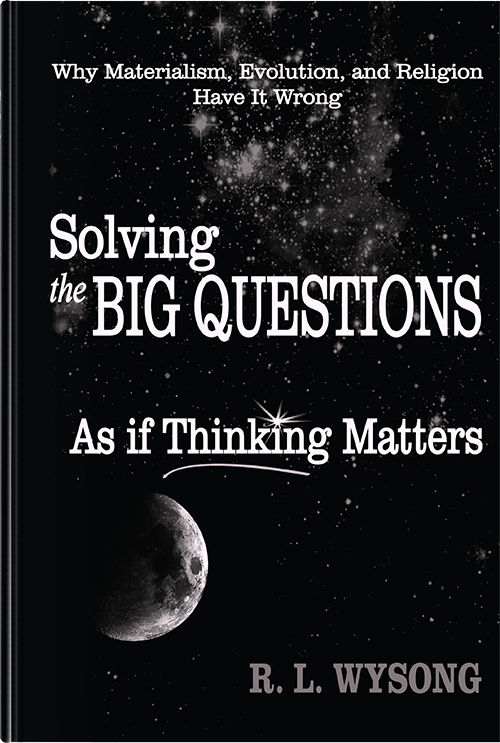 Hopefully it has become apparent in this and the companion book that open thinking could go a long way toward solving our personal, societal, environmental, health, and political problems, and even help answer the big questions. The key is to give reason and evidence a chance without making them first obedient to a belief we have prior commitments to. 62. WHY IS LIFE SO TOUGH AND CRUEL? In spite of the compelling reasons to believe that mind underlies our reality and that we are here for a purpose, life’s difficulties, cruelties, and tragedies lead many people to believe we are victims of blind materialistic forces. And it is true that life is often like licking honey off a thorn. Rage can overtake us in the face of life’s difficulties, leaving us with nothing better to do with our frustration than to fling curses toward a heaven that seems absent of anyone or anything that is decent enough to intercede. Once this narrow conclusion is embraced as invincible, any evidence to the contrary must be rejected. Alternatively, some are unwilling to ever believe that the creator is not an ever-present talisman. They reject the notion that they are alone in the world and at the whim of cold and heartless natural forces and chance. That, however, leaves them crediting the creator with ghastly acts as part of ‘His plan.’ To get around this, some religions have erected a theodicy, reconciling a kind and loving God with the evil in the world by removing Him from the world altogether. They create a deistic God who set things in motion and then, evidently not wanting to get his hands dirty, went on vacation leaving us holding the bag. That must be the case, it is reasoned, or otherwise the creator would step in and save us from nature’s wrath and the abuse from fellow humans. 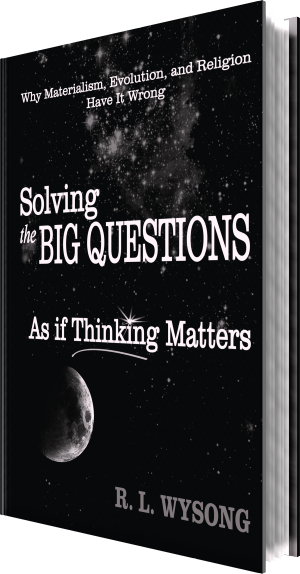 The succession of chapters in this book represents intellectual steps one may take in pursuing the big questions. Progress can be made as one idea builds on another, knowledge is gained, and experience with error, failure, success, and apathy bump us around inside life’s unpredictable pinball game. To score well, we must see life as a journey that should be traveled with an open mind. Unlike other journeys where there is a final destination, the open-minded pursuit of truth is about traveling but never getting too comfortable with any destination. We must be content with some mystery. Exciting headway can be made, but we cannot allow ourselves to reach a point of such certainty that we quit the quest. In this adventure there are many alluring forks in the road that dead end in sure beliefs requiring no bona fide proof. These cul-de-sacs are jam packed with people waving us in to join them. Comfortable residents there have ended their travels by surrendering their minds to certainties that are not certain in order to be happy ever after. People tend to be interested in any short cut they can find to answers so as to retire critical thinking, wed themselves to an idée fixe, and not be confused by any dialectic. It takes real fortitude to hold to a rational rudder and stay moving on the road. Using an open mind and letting honest thinking and the facts lead, we have arrived at the most plausible answers to the questions of where did we come from and where are we going. These answers give hints at solving the remaining question of why we are here, our purpose, but this central mystery to life needs to be more squarely addressed. Our purpose is obscured by our natural bias toward materialism. Day-to-day survival hinges on necessary physical things like food, clothing, and shelter. Our bodies are physical and so too are all the things that seem to bring us fun, ease, and security. It is therefore an easy step to conclude that matter is all that is important and that the atoms that make our remote controls and french fries are the same ones responsible for making us who we are.